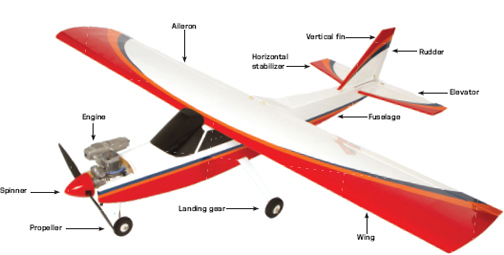 If you’re new to model airplanes, there are some basic terms and definitions you need to know. Before you get too involved with the various airplanes available, let’s talk a little about the basic parts that make up any model airplane. The three main assemblies are: the fuselage, the wing, and the tail components. Leading edge (LE): The very front edge of the wing. It is rounded to allow the air to flow easily over both the top and bottom surfaces. Trailing edge (TE): The tapered, most-aft edge of the wing. It is much more shapely and smaller than the leading edge to help the air passing over and under the wing to come back together with a minimum of drag or turbulence. Ribs: These give the wing its cross-section shape. This shape is also known as an airfoil, and it is this shape that generates the lifting force that allows airplanes to fly. Wingtips: These are at the very ends of the wing panels and are mostly cosmetic. They also reduce drag by helping the air flow more easily around the wing’s outer edges. Main spars: These give the wing its longitudinal strength and run from the wing root (middle of the wing) all the way to the tips. The main spar can be a single, solid piece of wood passing through the middle of the wing ribs or it can be made of two parallel spars notched into the top and bottom of the ribs. Usually smaller planes use a single main spar while some larger designs use a main spar and an aft spar, sometimes referred to as a secondary spar. Dihedral: This refers to the upward angle of the two wing panels relative to the fuselage and contributes to the model’s roll stability. The more dihedral angle the wing has, the more stable the model will be (to a point). The two wing panels are strengthened where they are glued together by a thick, strong dihedral brace or joiner. The fuselage is the main body of the airplane. All the other parts and components are attached to it. The fuselage houses most of the airborne radio equipment and the powerplant. Many trainers, as well as several scale and sport RC planes, use a simple box construction for the fuselage. A box structure fuselage has four flat sides: the top, bottom, and two vertical sides. Box construction is the easiest way to build a strong, simple structure and it has the added bonus of being much easier to cover and finish. Firewall: The engine is attached to the firewall and sometimes the model’s nose wheel is also secured to the firewall. Formers: These internal vertical structures support the sides and give the fuselage its strength and rigidity. Doublers: These are glued to the inside of the fuselage sides to add strength in specific, high-stress areas. They can be located in the tail and wing attachment points and around the landing gear attachment areas. Longerons: These are long, stick-like parts that run from nose to tail, and they support and strengthen the fuselage structure. Stringers: Stringers are similar to longerons but typically are small and used to support the model’s covering, which gives the fuselage its shape. Wing saddle: This is the part of the fuselage that the wing rests on. Usually this is also the main opening for access to the radio equipment.